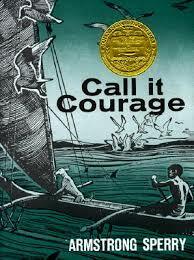 This children’s book is aptly named Call It Courage, but I want to say, Call It Riveting. This tale is told as if on one long breath, an exhalation that ends in exultation. There is not a moment where you can rest until the tale is told, which of course, is what makes a great tale, and a great children’s book. It appears that this is actually a true Polynesian legend, beautifully enhanced and retold by the author. It created a vivid experience for me of life on the Islands, bringing back memories of the times I lived in Micronesia. In other words, it is a completely authentic depiction of island life, though from a much, much earlier time. Besides being an exciting tale, a compelling reason for sharing this children’s book is to open the door to conversations about overcoming fear, and what it takes to meet unprecedented challenges. It is not likely today’s child will have to deal with survival as directly as Mafatu did in this tale. Yet, it’s thought provoking… what could we do if our life depended on it? And how do we deal with very legitimate fears from traumatic events? I was uncertain about the age for this children’s book. However, I think that it’s fine for 8 and over, if they are not too sensitive. It’s particularly good for boys, especially those who might love the outdoors and the sea. There’s also a guide to using this in the classroom, for teachers and homeschooling parents.